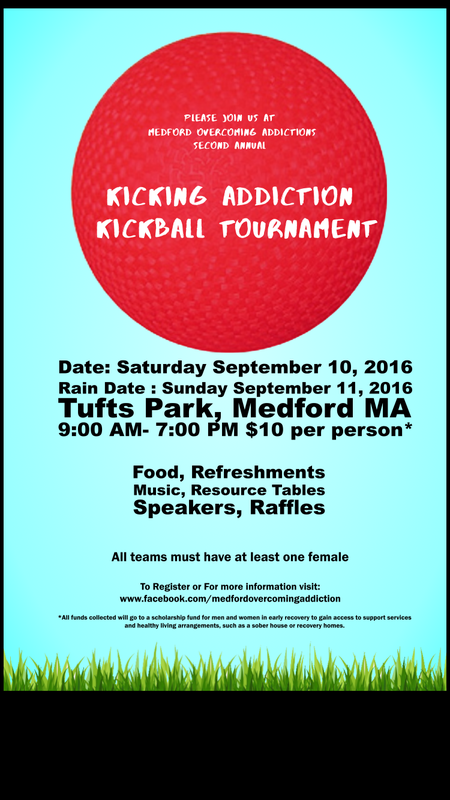 Come “kick off” Recovery Month with Medford Overcoming Addiction’s 2nd Annual “Kicking Addiction” Kickball Tournament ! Happening on September 10th starting at 9 AM at Tufts Park in Medford. We will have food, music, raffles, vendors, resource tables, kids activities, speakers and of course kickball ! This is a family fun event for all to join. All funds raised will got to a scholarship fund for men and women in early recovery to gain access to support services and healthy living arrangements, such as a sober house or other types of recovery houses. Lets work together to break the stigma, raise awareness and kick addiction in Medford! I have attached our flyer and below is our fundraising page. If you have any questions please feel free to send us an email.